10 A None No Power Seat 10 A is a standard Economy Class seat that is part of the Exit Row. The seat features exceptional additional legroom due to the absence of the seat ahead. The tray table is located in the armrest making the armrest immovable, therefore, reducing seat width. 10 F None No Power Seat 10 F is a standard Economy Class seat that is part of the Exit Row. The seat features exceptional additional legroom due to the absence of the seat ahead. The tray table is located in the armrest making the armrest immovable, therefore, reducing seat width. 23 F None No Power Seat 23 F is a standard Economy Class seat that has limited recline due to the Exit Row behind. 24 A None No Power Seat 24 A is a standard Economy Class seat that Aegean Airlines designates as a "Up Front" seat. This seat has additional legroom and allows you to be one of the first to disembark, but costs extra to book. The tray table is installed in the armrest making the armrest immovable, therefore, slightly reducing seat width. There is no floor storage available for use during takeoff and landing. 24 B None No Power Seat 24 B is a standard Economy Class seat that Aegean Airlines designates as a "Up Front" seat. This seat has additional legroom and allows you to be one of the first to disembark, but costs extra to book. The tray table is installed in the armrest making the armrest immovable, therefore, slightly reducing seat width. There is no floor storage available for use during takeoff and landing. 24 C None No Power Seat 24 C is a standard Economy Class seat that Aegean Airlines designates as a "Up Front" seat. This seat has additional legroom and allows you to be one of the first to disembark, but costs extra to book. The tray table is installed in the armrest making the armrest immovable, therefore, slightly reducing seat width. There is no floor storage available for use during takeoff and landing. 24 D None No Power Seat 24 D is a standard Economy Class seat that Aegean Airlines designates as a "Up Front" seat. This seat has additional legroom and allows you to be one of the first to disembark, but costs extra to book. The tray table is installed in the armrest making the armrest immovable, therefore, slightly reducing seat width. There is no floor storage available for use during takeoff and landing. 24 E None No Power Seat 24 E is a standard Economy Class seat that Aegean Airlines designates as a "Up Front" seat. This seat has additional legroom and allows you to be one of the first to disembark, but costs extra to book. The tray table is installed in the armrest making the armrest immovable, therefore, slightly reducing seat width. There is no floor storage available for use during takeoff and landing. 24 F None No Power Seat 24 F is a standard Economy Class seat that Aegean Airlines designates as a "Up Front" seat. This seat has additional legroom and allows you to be one of the first to disembark, but costs extra to book. The tray table is installed in the armrest making the armrest immovable, therefore, slightly reducing seat width. There is no floor storage available for use during takeoff and landing. 33 C None No Power Seat 33 C is a standard Economy Class seat. The close proximity to the galley and lavatory area might be bothersome. 33 D None No Power Seat 33 D is a standard Economy Class seat. The close proximity to the galley and lavatory area might be bothersome. 34 A None No Power Seat 34 A is a standard Economy Class seat located in the last row of the aircraft. Seat back recline might be limited due to the wall of the lavatory directly behind. Also, if the seat back in front is reclined then there will be a reduction of personal space. The proximity to the galley and lavatory area might be bothersome. 34 B None No Power Seat 34 B is a standard Economy Class seat located in the last row of the aircraft. Seat back recline might be limited due to the wall of the lavatory directly behind. Also, if the seat back in front is reclined then there will be a reduction of personal space. The proximity to the galley and lavatory area might be bothersome. 34 C None No Power Seat 34 C is a standard Economy Class seat located in the last row of the aircraft. Seat back recline might be limited due to the wall of the lavatory directly behind. Also, if the seat back in front is reclined then there will be a reduction of personal space. The proximity to the galley and lavatory area might be bothersome. 34 D None No Power Seat 34 D is a standard Economy Class seat located in the last row of the aircraft. Seat back recline might be limited due to the wall of the lavatory directly behind. Also, if the seat back in front is reclined then there will be a reduction of personal space. The proximity to the galley and lavatory area might be bothersome. 34 E None No Power Seat 34 E is a standard Economy Class seat located in the last row of the aircraft. Seat back recline might be limited due to the wall of the lavatory directly behind. Also, if the seat back in front is reclined then there will be a reduction of personal space. The proximity to the galley and lavatory area might be bothersome. 34 F None No Power Seat 34 F is a standard Economy Class seat located in the last row of the aircraft. Seat back recline might be limited due to the wall of the lavatory directly behind. Also, if the seat back in front is reclined then there will be a reduction of personal space. The proximity to the galley and lavatory area might be bothersome. 8 A None No Power Seat 8 A is a standard Economy Class seat that has additional legroom but limited recline due to the Exit Row behind. Aegean Airlines charges extra for this seat. 8 B None No Power Seat 8 B is a standard Economy Class seat that has additional legroom but limited recline due to the Exit Row behind. Aegean Airlines charges extra for this seat. 8 C None No Power Seat 8 C is a standard Economy Class seat that has additional legroom but limited recline due to the Exit Row behind. Aegean Airlines charges extra for this seat. 8 D None No Power Seat 8 D is a standard Economy Class seat that has additional legroom but limited recline due to the Exit Row behind. Aegean Airlines charges extra for this seat. 8 E None No Power Seat 8 E is a standard Economy Class seat that has additional legroom but limited recline due to the Exit Row behind. Aegean Airlines charges extra for this seat. 8 F None No Power Seat 8 F is a standard Economy Class seat that has additional legroom but limited recline due to the Exit Row behind. Aegean Airlines charges extra for this seat. 9 B None No Power Seat 9 B is a standard Economy Class seat that Aegean Airlines designates as a "Up Front" seat. This seat has additional legroom and allows you to be one of the first to disembark, but costs extra to book. This seat has limited recline due to the Exit Row behind. The tray table is installed in the armrest making the armrest immovable, therefore, slightly reducing seat width. There is no floor storage available for use during takeoff and landing. 9 C None No Power Seat 9 C is a standard Economy Class seat that Aegean Airlines designates as a "Up Front" seat. This seat has additional legroom and allows you to be one of the first to disembark, but costs extra to book. This seat has limited recline due to the Exit Row behind. The tray table is installed in the armrest making the armrest immovable, therefore, slightly reducing seat width. There is no floor storage available for use during takeoff and landing. 9 D None No Power Seat 9 D is a standard Economy Class seat that Aegean Airlines designates as a "Up Front" seat. This seat has additional legroom and allows you to be one of the first to disembark, but costs extra to book. This seat has limited recline due to the Exit Row behind. The tray table is installed in the armrest making the armrest immovable, therefore, slightly reducing seat width. There is no floor storage available for use during takeoff and landing. 9 E None No Power Seat 9 E is a standard Economy Class seat that Aegean Airlines designates as a "Up Front" seat. This seat has additional legroom and allows you to be one of the first to disembark, but costs extra to book. This seat has limited recline due to the Exit Row behind. The tray table is installed in the armrest making the armrest immovable, therefore, slightly reducing seat width. There is no floor storage available for use during takeoff and landing. Aegean Airlines Airbus A321-200's are used on long-range and heavy-capacity routes. I have travelled on this plane 4 times in the last week and I can confirm that the earlier comment posted 29/8/17 is incorrect. Having read the comment I originally changed my booking to row 23 and I am so glad I changed back to 24. There is a full sized emergency exit door between rows 23 and 24, meaning that row 24 has about 6 feet of legroom. The row 23 A and F are jump seats used by crew for take-off and landing (although only 23F on one leg). The seating plan needs to be updated as it is incorrect. I flew on two occasions in August 2017 with Aegean A321 jets. The seat map on Seat Guru appears to be outdated, showing rows up to no.34, instead of up to no. 35 as is the diagram provided by Aegean when you complete your online check-in. This affects the second exit row, which I found to be at row 23 NOT row 24. On my flight, there was a huge gap between the exit row 23 and row 22 in front of that; it was almost as large as 1.5 rows of seats. It is also worth noting that row 22 is the usual 3x3, not the 2x2 as you find in row 9. Speaking of row 9, in terms of leg room, those are the seats to choose. 10A and 10F also offer plenty of leg space. I cannot comment on the seat pitch or ability to recline (which you should probably avoid doing in any row, on any plane these days - be kind to the person behind you! ), as I was not seated there. It is also worth adding that all economy seats at least up to row 8, have better legroom than further back in the plane, as these can be converted to business seats. That said, row 8 seats appear not to recline and might have a slightly different pitch to accommodate the emergency exit directly behind. Incidentally, Aegean planes do not have a row 13, as is customary on some airlines. In the case of company's the A321 jets, row 13 did not exist in the 34 row configuration, or the current 35 row arrangement. Flew MXP-ATH on this plane-seat combination. It was the newest A321 of the fleet and despite already 9 years old in perfect condition in the interior. Having paid for Economy class I was able to locate this specific seat as available during the online check-in, and I wasn't let down. Actually, it turned out to be a Business row, with 33 inch seat picht. Business on our flight was reserved on the 3 forward rows, with the middle seats left vacant and turned into armrests. Rows 4 to 8 were Economy, but with the same seat pitch as Business (all the seats in the Aegean Airbus fleet are the same). 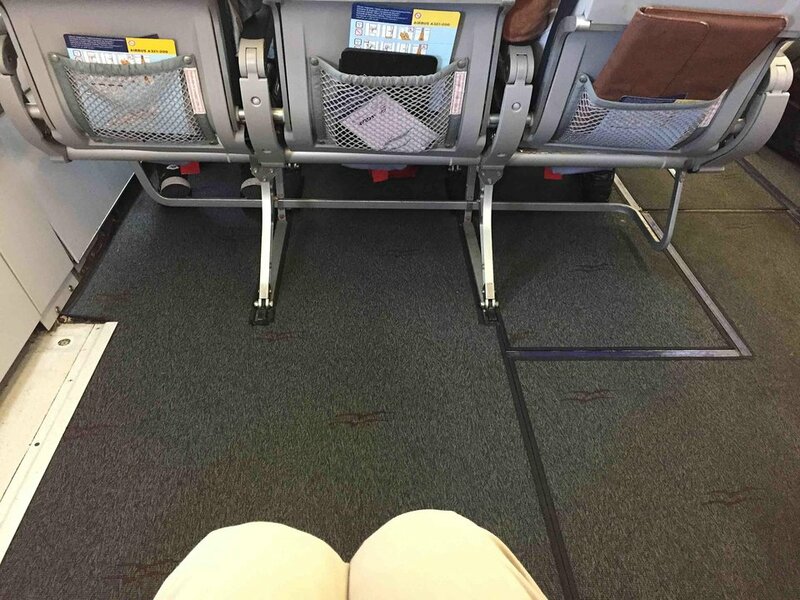 Therefore, combined with the standard and free food and beverage offered in all of the Aegean European flights, it was the exact opposite of the usual low cost cramped no-frills flights. The food was nice and the service was excelent. Definitely flying again with Aegean. All Seats in Row 24 have exceptional legroom. The window for seats 24A and 24F are positioned just in front of the headrest, so looking out of the window for a prolonged time is uncomfortable. Aegean Airlines flies 1 versions of Airbus A321.